Major repair and resurfacing works to one of Rotherham town centre's major routes will take place over the summer. Major work is required on Centenary Way that plays a critical role in managing traffic movements through and around the town centre, forming part of both the inner and outer ring road. Rotherham Council is set to carry out repairs to the joints and road surfacing that are part of a bigger scheme to refurbish Crinoline Bridge. Other works will also be taking place beneath the roadway to repair the concrete elements of the bridge. Rothbiz has previously reported that the route is at risk of closure. 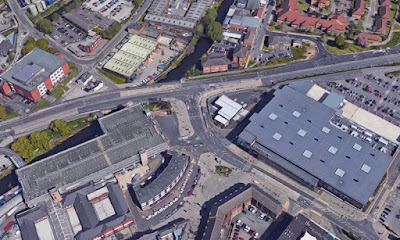 The bridge is close to the interchange and the junction created for the Tesco development on Drummond Street. Scheduled inspections over the past 20 years have revealed severe issues with the bridge joints. More recent specialist inspections have identified severe corrosion and concrete spilling over large areas. The life expectancy of the bridge has dramatically reduced and the most cost effective solution is to rebuild the top of the abutments and replace the deck of the bridge to modern design standards. A bid was submitted for support from the Government's Local Highways Maintenance Challenge Fund, having earlier been turned down for cash. The bid was for £2.8m, with £960,000 coming from the Council, who would also meet any cost overruns. £1.312m has now been set aside in Rotherham Council's budget for much-need repairs to Crinoline Bridge. Motorists are being warned that to enable the work to take place at this busy section of road, weekend closures will be taking place usually between 7.00 pm on Saturday nights until 5.00 am on Monday mornings during weekends over the school summer holidays. The closures, beginning this weekend, will be between College Road roundabout and the junction with Drummond Street. Traffic will still be able to travel between St Ann's Roundabout and Drummond Street. Six further closures will then take place during the summer. The closure this weekend however, will be slightly shorter, and will be from 7.00 am until 7.00 pm on Sunday only. Cllr. Denise Lelliott, cabinet member for jobs and the local economy at Rotherham Council, said: "These vital works, alongside the nearby improvements to Rotherham Interchange, are an important part of ensuring Rotherham's town centre transport links are the best they can be as we move forward with the Town Centre Masterplan and look to grow Rotherham's economy." Paul Woodcock, assistant director for planning, regeneration and transport, added: "These are major engineering works to ensure the safety and improve the road surface of one of the key routes through Rotherham town centre. "We apologise for any inconvenience to motorists during these works, which have been scheduled on weekends, mainly during the school holidays, to ensure minimal disruption."